Chickweed is available most of the year but I love to gather it in early Spring. It is a tiny sprawling plant with white star-like flowers and easily overlooked. I use it in salads, juice it and sometimes steam it. It makes a good pesto as it has a slightly salty taste. Try it as a tea or light nutritious broth. It is rich in chlorophyll, vitamins A and C, and minerals such as iron, copper, magnesium, selenium, GLA, thiamine and calcium. Chickweed is high in saponins that help to cleanse the lymphatic system and soothe inflammation. It’s saponins also help to emulsify fat, which is why it earned a reputation as a slimmer’s herb. Stellaria media is a low growing, sprawling annual. You will find it growing in clumps alongside grassy areas, hedgerows and amongst other weeds. It measures about 3 to 12 inches (7-30 cm) tall. It has tiny oval shaped leaves with a pointed tip. Both the leaves and stems have tiny soft hairs. The star-shaped white flowers have 5 petals, hence the Latin name Stellaria, which means star. Be careful when foraging for wild food and be sure you have correctly identified a plant before consuming it. Pick tender shoots, remove any roots and brown parts. The saponins make the stems stretch, discard any tough stringy stems, although mostly this is a tender plant. Chickweed is a nutritious wild food and medicine. Add young leaves, stalks and flowers to salads, or blend with olive oil and garlic for a tasty and nourishing pesto. Juice it to get the most benefits. For a frothy smoothie combine fresh chickweed with citrus fruits. You can refrigerate it as you would any leafy green. 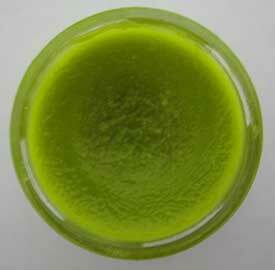 I also use it to make salves for eczema and any itchy skin conditions. You can add a couple of handfuls to a bath to soothe itchiness. 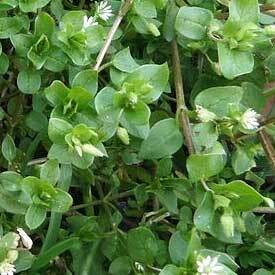 Chickweed is a diuretic so an infusion is good if you are suffering with water retention. It is also soothing for sore throats and makes a great spring tonic however you take it. It is cleansing for the blood and lymphatic system.